The purpose of councils is to provide the community with effective local and democratic government. The Lismore City Council area is represented by 11 elected Councillors, including the popularly elected Mayor, who holds office for a four-year term. For electoral purposes, there are two voting methods available for use in local government elections. Our Council has opted to use the 'undivided' method where residents and ratepayers in the Lismore LGA vote for any of the nominated candidates. The other method is wards or the 'divided' method and in these cases each ward is represented by a number of Councillors who have been chosen by the electors of that ward. If a council wishes to change the number of council representatives or the method used to elect Councillors, it requires a constitutional referendum to be held. The power delegated to Lismore City Council and other councils throughout the State is derived from the Local Government Act 1993 and other Acts enacted by the parliament of NSW. A Councillor’s responsibility is to make decisions on all areas of policy and budget priorities, including the level and extent of services and works to be provided during the year. Decisions are determined using the majority voting system in which each Councillor has one vote. If there are an equal number of votes, the Mayor has the casting vote. If you wish to make an application for information under the above act you will need to fill out the Government Information (Public Access) Act 2009 Access Application. Council is required to record information about access applications made where access is provided to information (be it some or all of the information applied for) that may be of interest to other members of the public. This is recorded in our Disclosure Log. Councillors adopted the following Code of Conduct. Outgoing correspondence from Lismore City Council that requires a signature will be digitally signed in accordance with best-practice recordkeeping and governance procedures. For more information please read our Corporate Procedure – Signing Outgoing Correspondence. 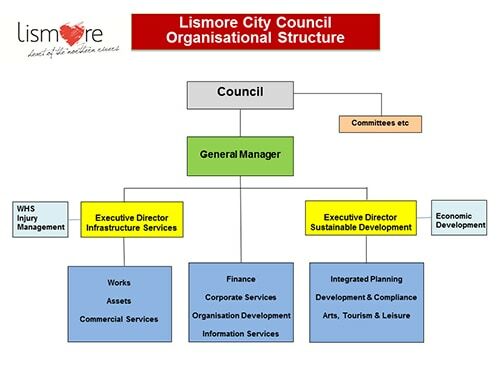 Lismore City Council is constituted under the Local Government Act 1993. The general structure of Council is shown here. Council adopted this current organisational structure in accordance with Section 333 of the Local Government Act 1993. To provide directly or on behalf of other levels of government, after due consultation, adequate, equitable and appropriate services and facilities for the community and to ensure that those services and facilities are managed efficiently and effectively. To exercise its functions in a manner that is consistent with and actively promotes the principles of cultural diversity. To promote and to provide and plan for the needs of children. To have regard to the long term and cumulative effects of its decisions. To bear in mind that it is the custodian and trustee of public assets and to effectively account for and manage the assets for which it is responsible. To facilitate the involvement of councillors, members of the public, users of facilities and services and council staff in the development, improvement and co-ordination of local government. To raise funds for local purposes by the fair imposition of rates, charges and fees, by income earned from investments and, when appropriate, by borrowings and grants. To keep the local community and the State Government (and through it, the wider community) informed about its activities. To ensure that, in the exercise of its regulatory functions, it acts consistently and without bias, particularly where an activity of the Council is affected. Our Council makes decisions that align with our community strategic plan entitled Imagine Lismore. Here is a summary of the principles it involves. Lismore City Council has a total commitment to the philosophy of open government and Council has adopted as policy that "Public participation and involvement in decision making will be facilitated to the maximum extent possible". To achieve this, Council has developed a number of mechanisms whereby the public can participate in the decision making process and be aware of matters before Council. The person wishing to ask a question may during the time allocated for this item of business stand and upon being called by the chairperson shall give his/her name, address and the question that person desires to ask. The chairperson has the right to require that the question be put in writing and the right to refuse to deal with any question. A Councillor who has been asked a question may call on an officer to assist in answering the question. Any Councillor or officer to whom a question is directed shall have the right to reply to a subsequent Council meeting or to forward a written reply to the person asking the question. A public access session is held prior to ordinary and special Council meetings commencing at 6pm. Each speaker is limited to three minutes and may share his/her allocated three minutes with others should they wish to do so. Each speaker shall not be limited to one topic but limited to matters listed on the business paper. All requests shall be authorised by the General Manger and where at all possible shall be included in the business paper. Requests may be made up until the commencement of the public access session. All Council meetings are included in the fortnightly publication Local Matters specifying date, time and location of meetings including a listing of major public interest agenda items. Council supplies Council Business Papers to the public at its offices free of charge and offers a similar service by mail, subject to a postage and handling fee. Copies are also available for the public to read at the Lismore City Library, all rural general stores, the Nimbin Neighbourhood Centre and here on our website in the Business Papers section. Council is required under legislation to advertise proposals and call for public comment. Such advertisements are placed in Council's fortnightly publication Local Matters. Council documents covered by the GIPA Act can be available for inspection at Council's Corporate Centre, 43 Oliver Avenue, Goonellabah. You may be required to complete a Lismore City Council Information Request. For more information phone our Public Officer on 1300 87 83 87.